What is the Wearable Artificial Kidney? 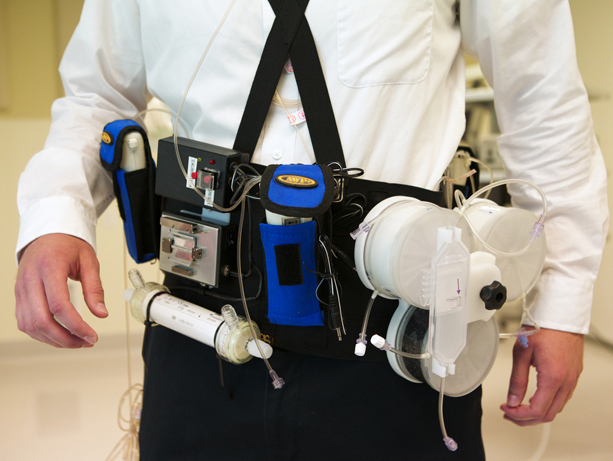 The Wearable Artificial Kidney, also known as the WAK, is a miniaturized dialysis device that can be worn like a tool belt. It connects to a patient via a catheter. Like more sizable dialysis machines, it was designed to filter the blood of people whose kidneys are no longer working. Unlike current portable or stationary dialysis machines, it runs continuously on batteries and is not plugged into an electrical outlet or attached to a large water pipeline. What is the impetus for developing such a device? One reason for developing the device is to allow patients more mobility during a dialysis session and the ability to go about some of their daily activities while the device runs. With present-day dialysis treatment, patients are tethered to a cumbersome machine. On average, such sessions occur three times a week and three to four hours each time. Another reason the researchers entered this device-development field is because they were concerned about the lack of progress in treating patients with end-stage renal disease. People with this condition have a relatively poor quality of life and a high mortality rate. Who created the Wearable Artificial Kidney? Where did early research take place? Dr. Victor Gura, a physician specializing in internal medicine and kidney disease, created the initial prototypes for the WAK in his clinic in Beverly Hills, Calif. He completed the prototypes in a lab at Cedars-Sinai Hospital in Los Angeles. His original team included the late Austrian physicist and equipment safety standards developer Hans Dietrich Polachegg, as well as bioengineer Masoud Beizai, and physician and medical device researcher Carlos Ezon, both of whom live in Los Angeles. Gura is a clinical associate professor at the David Geffen School of Medicine at UCLA. Are there any patents or trademarks on the device? The device and its components have several U.S. and foreign patients. Wearable Artificial Kidney is being registered as a trademark. At what stage of development is the device you plan to test? The WAK already has been tested in laboratory, animal and preliminary human studies. The results, and supporting data, are in the public domain in peer-reviewed medical journals. In the pending study, researchers will test the safety and clinical performance of the current prototype in patients for longer sessions than previously attempted. This will be the first human trial of the device in the United States under the agreement with the Food & Drug Administration as part of the FDA’s Innovation 2.0 Pathway. What is the FDA Innovation Pathway? How is it changing how medical devices such as this one are tested and approved? FDA’s Innovation Pathway is an evolving system designed to help safe, breakthrough medical products reach patients in a timely manner. The Pathway ultimately aims to shorten the overall time and cost it takes for the development, assessment and review of medical devices, and to improve how FDA staff and innovators work together. As part of the Innovation Pathway program, in January 2012 the FDA announced the Innovation Challenge – a pilot program for inventive devices that address end-stage renal disease. Out of the 32 applications, the FDA accepted three, which then participated in the Innovation Pathway.Their participation allowed the FDA to assess the strengths and weaknesses of the Pathway’s features and fine-tune them for broader application. The FDA created a team to work with the three accepted applicants. The WAK team received extensive guidance and quick review of this technology. This would expedite approval if the device meets safety, performance, and effectiveness standards. For the upcoming trial, Blood Purification Technologies Inc., a company owned by Dr. Gura, has received an Investigative Device Exemption from the FDA, which allows the clinical trial to proceed. Who will be conducting the Seattle safety and performance trials of the device? The trial will be conducted by the University of Washington. Principal investigator is Dr. Jonathan Himmelfarb, professor of medicine, Division of Nephrology in the UW School of Medicine, and director of the Kidney Research Institute, a collaboration between the Northwest Kidney Centers and UW Medicine. How much does the current model of the WAK weigh and how does a patient put it on? What does it look like? The current version of the WAK model weighs about 10 pounds. It looks like a construction worker’s tool belt. This version is still an experimental prototype that will ultimately undergo further miniaturization and design improvements to make it smaller, lighter, more streamlined and easier to use. What new technologies make this possible? What obstacles had to be overcome? New technologies that are making the prototype of the Wearable Artificial Kidney possible are lighter, more durable batteries and better plastics, and a new type of pump that manages the flow of blood and water inside the device and that has a different flow pattern from current dialysis machines. Finding a way to configure certain chemicals, among them sorbents and enzymes, used in past dialysis machines also played an important role in developing the WAK. What are other examples of researchers working on wearable kidney dialysis devices? A group in The Netherlands is working on a hemodialysis wearable device. At least two other teams are working on a wearable peritoneal dialysis device: Renal Solutions, a subsidiary of Fresenius, and a group in Singapore, associated with Baxter, which is developing the AWAK. The WAK researchers said they believe that wearable peritoneal dialysis would be a welcome complement to the ways in which patients with end-stage renal disease could be treated, but added that neither of these devices would compete with the WAK as they would be created for different subgroups of patients. How does the Wearable Artificial Kidney differ from currently available technologies for kidney failure? Hemodialysis is now delivered with equipment that is much larger than the WAK. No other machines run on batteries, and all of them require an abundant amount of fresh water – about 40 gallons per treatment. As a consequence, the patient is tethered to the equipment and cannot walk around or move too much. All existing equipment runs intermittently for only about a few hours each time. The WAK will work continuously. It operates on batteries and takes about a pint of water a day. These features would allow patients to walk, go out shopping, work or do errands -- in other words, be active instead of confined during a dialysis session. The WAK works continuously and slowly to remove fluids from the body at the same pace as healthy kidneys do naturally. The researchers expect that patients will not feel the effects of rapid fluid removal, as they often do with current dialysis methods. The WAK operates with sterile water, making the transfer of bacterial particles, viruses and toxins less likely. Because the patients would maintain normal water, salt and mineral balance, they could be relieved of certain diet restrictions. The researchers also hope to reduce the burden of swallowing many pills every day. What is the soonest the Wearable Artificial Kidney could be available for general use? Future clinical trials of the device would be planned and conducted in collaboration with the FDA Innovations Pathway. At this point it isn’t possible to provide a firm time frame for availability. Before it could be a real option for general use by patients in renal failure, the WAK still must pass several clinical trials and undergo design improvements. Its continued development also would require obtaining additional funding. What will the pending Seattle Wearable Artificial Kidney patient trial measure? The Seattle trial will be the first in which the WAK is kept working on each patient volunteer for 24 hours. The goal of the trial is to demonstrate that the WAK is as safe and effective as a standard dialysis machine. What studies of the Wearable Artificial Kidney have been completed? Is this the first patient trial? Dr. Victor Gura previously studied the WAK in bench and animal trials in his lab at Cedars-Sinai Hospital in Los Angeles. He then tested it with patients in Vicenza, Italy, and in London in collaboration with local teams in each country.End-stage renal disease patients were treated in both trials, in Italy for six hours and in Britain for eight hours. Gifts and donations are funding the trial. How will patients be selected for this safety trial? The researchers conducting the safety trial will select patient volunteers according to the strict inclusion and exclusion criteria of the study protocol. The FDA and the UW Institutional Review Board, which protects the interests of human subjects, have approved the selection criteria. What are the criteria for being chosen as a participant? Only patients who have a catheter for blood access will be eligible. For safety reasons, the WAK cannot be connected with needles inserted in a patient’s arm fistula or graft, and held in place with tape. Needles placed in that manner could dislodge while the patient is walking. Several other criteria restrict who is eligible for this trial. Up to 16 patients will be selected for this safety trial, with the goal of having 10 subjects complete the full study protocol. Where will you recruit the participants? The treatment with the WAK will take place at University of Washington Medical Center in Seattle and last only 24 hours. Then subjects will be observed for at least 28 days afterward.It would not make sense to include patients from far away due to logistics. The local team in Seattle will recruit patients from the Pacific Northwest. The study team members said that they are deeply moved by patients from around the globe who have contacted them to volunteer to serve as subjects for this trial. These patients are eager to see the advent of better technologies to improve their lives and the lives of others with the same medical condition. The duration of this safety trial, however, does not allow for national or worldwide recruitment of volunteers. What will occur during the testing of the device with patients? After their regular dialysis, the patients will be connected to the WAK for 24 hours and closely monitored by nephrology nurses and physicians. The inventor and his team will also be present during the trial. The patients will be encouraged to eat, drink and move around while the WAK is running. Blood samples will be drawn periodically to determine that no excess water, salt and toxins accumulate during treatment with the WAK. At the end of the 24-hour dialysis, the patients will be disconnected from the device and will undergo a few more tests to measure what happens to their body composition after the WAK stops running. How long will participants wear the device? Each participant will wear the device for one 24-hour session. What are the risks of participating in the safety trial? In general terms, many of the known risks in this trial are similar to those of regular dialysis. Nonetheless, this is a new device and unforeseen risks can occur in any clinical trial with a novel technology. The trial will be conducted in a supervised inpatient hospital setting. In the event of problems or complications, the research team and hospital staff can respond quickly to mitigate any adverse effects. When do you expect to have results? Results will be available after the trial is completed, the data analyzed and the findings peer-reviewed. The date of release of results to the public cannot be determined at this time.